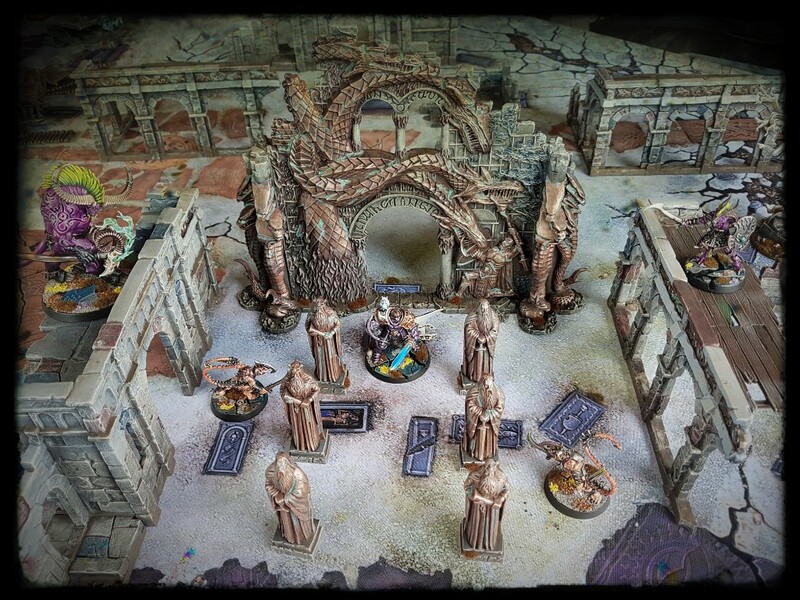 Of the four Age of Sigmar terrain sets released when the game came out, the Ophidian Archway was the one that appealed to me the least. It’s a ruin, albeit possibly the ruin of Elton John’s birthday party venue or something, but it’s still just a ruin. Compared with gates to other dimensions, spinning technarcana and floating staircases surrounded by fiery pillars (coming soon!) 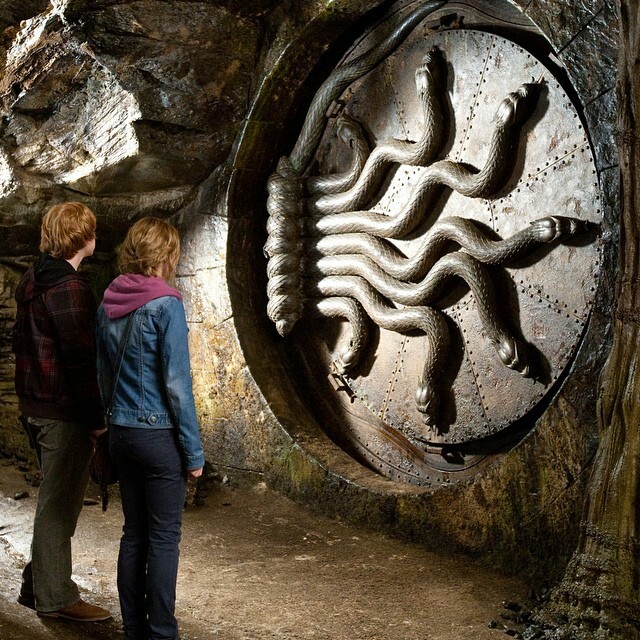 a ruin with an elaborate door just didn’t seem properly turned up to eleven. 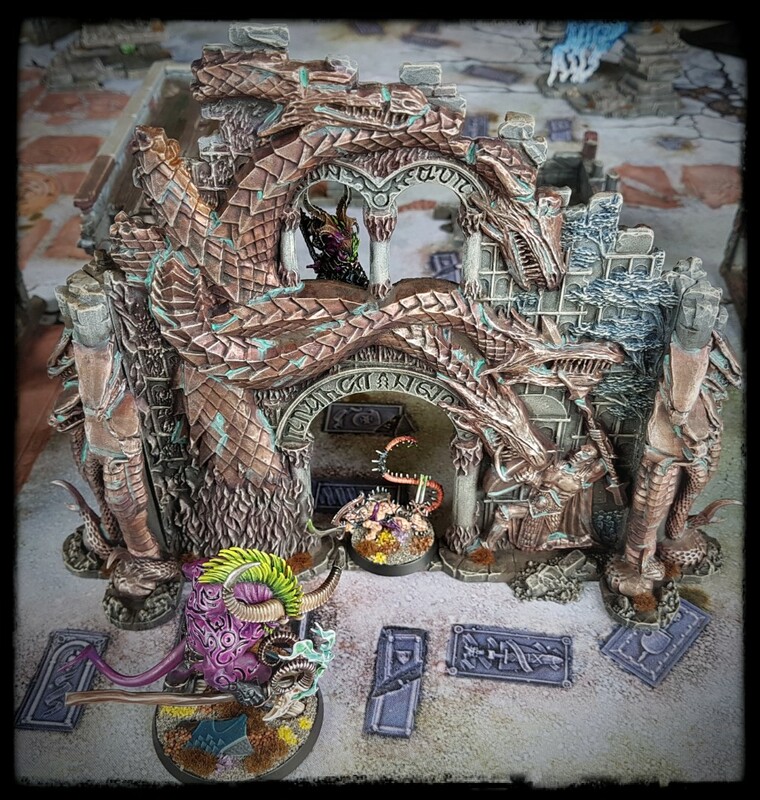 Having gathered enough day-to-day fantasy ruins, I figured that it would be worthwhile to include the rather heavily decorated Ophidian Archway anyway though. Regardless of its (relatively) more mundane nature, it looked like fun to paint if nothing else. 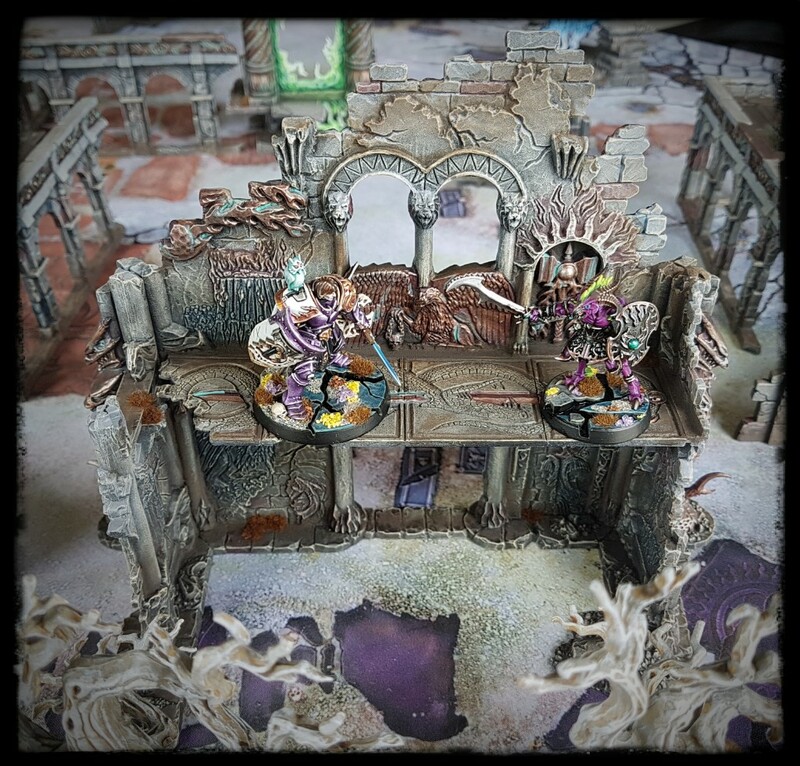 It can represent the ruin of the Age of Sigmar equivalent of a dull civil building, such as the DMV or, if used in a modern, setting the model can represent the wreck of a 24hr-burlesque-bar-n-grill. As is often the case with things like this, I found the archway quite pleasant to paint. Painting the Ophidian Archway remained a pretty much by-the-numbers approach, as seen in previous entries in this series, but I did focus some of the more colourful washes normally reserved for the brickwork on some of the friezes and pictorial relief, just to see if it the subtle change in tone would make them stand out a little. It did. A little. I could perhaps have pushed it further, but I would rather that something like that was underdone than overdone. A wizard did it indeed. I like the paint job even if the terrain piece itself is faintly a hot mess. “Needs more snakes, Jenkins!”. “Yes sir, more snakes.”. I’m sure it’ll fit in great on your demented gaming tables. I don’t regard my tastes in miniature escapism as being wilfully contrary, but people do tend to say it. I certainly enjoy having a few absurd props to reinforce the structure of hilarity required for playing games. The thing is, the people that I have played games with most over the years play reasonably “hard”. The games that I want to play must be good natured, sportsmanlike, exciting and (crucially) amusing. But those things, including the more oddball aspects of my terrain and miniatures, don’t preclude the games from being taken seriously. Essentially, I take my ridiculous gaming seriously. My samurai are as close as I have got to historical gaming and even so, I have added fantasy elements to them. I appreciate that if everything is zany then nothing is, but there will always be room for exotic terrain really. Brilliant! Chugging at a pace but keeping up the quality! The Mage Throne is en route, have no fear! It’s the older version that sits on the pillar of huge skulls. Might as well go all in. I really like the palette of your lost city, it is not quite ‘right’. Yeah, it’s intentionally a little bit “other”. While I want the terrain to look believable in its own context, I don’t really want it to look like something historical. It probably owes more to Filmation backgrounds than to history books.